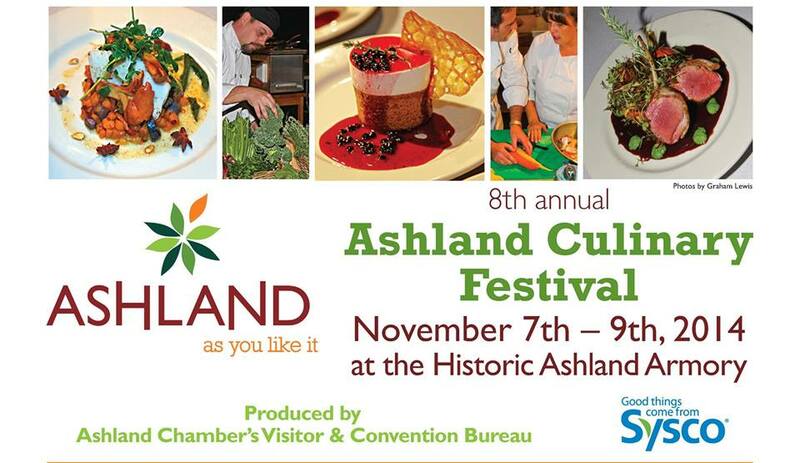 The Ashland Culinary Festival is almost here, and I’ll be there as a judge for the competition! I am super excited to meet the chefs in person that will be competing for the Top Chef honor in the 8th annual festival. While this is my first year being a judge, I am certain you won’t want to miss a single bite these chefs have to offer. Chefs take competition very seriously. If you are willing to be in a culinary competition, you certainly have a competitive nature. That is part of what drives an already amazing chef to be even better, a little friendly competition, and the rights to a Top Chef title. I asked all of the competitors a few simple questions that everyone wanted to know. I love all of the answers from their favorite food on a day off, to what they love to cook at their restaurant. It was nice to get to know the chefs a bit before they compete, and I cannot wait to eat everything they prepare. I am the luckiest girl in the world! Here are the answers to the first half of the chefs…See Part II on Friday! Please welcome Franco Console from Larks Home Cuisine Kitchen, Stefano Cipollone from Belle Fiore Winery, Skye Elder from Brickroom, Dale Fowler from Regency Grill, and Jasmine Turk-Bly from Ashland Creek Inn! Sushi or Pizza & beer. It is a great way to get to know local chefs and local purveyors, also a great way to educate the general public about farm to table local cuisine. 3. What is the most popular dish at your restaurant? AND/OR What is your favorite dish you prepare at your restaurant? Our most popular dish is our southern fried chicken with bacon gravy. Favorite dish is our braised pork shank with stone ground mustard whipped potatoes, house bacon jam & apple cider cabbage. This time of year, I love anything braised or slow cooked. I love the layers of flavor that you get when you cook something for hours, and don’t forget the wonderful smell that fills the house. Currently, my favorite thing to braise are pork shanks. More than anything it’s FUN! Getting to compete amongst friends is why I do it. You get to meet so many people from other Wineries and Restaurants. Popular dishes on the menu, but my two personal favorites are our Pork Shank braised with freshly juiced apples, served over a potato herb Rösti, wilted Kale, and a Honey Lavender braising jus. The other dish is our Muscovy Duck breast with three potato hash (purple, sweet potato, and Yukon) served with a Huckleberry Mostarda. On my days off I enjoy any meal that I can eat with my family, but I especially love making bread at home, it seems like the right thing to do. In the kitchen chefs work under certain parameters on a daily basis. These vary depending on the kitchen, menu, business level,.etc.. The Ashland Culinary Festival offers a unique opportunity for us to cook within the exact same circumstances and test our skills and inspiration. It’s exciting! We have a brand new space here at The Brickroom so everything is still really fun to cook. I am proud of our burger with my jam and goat cheese frosting, I love all of our sandwiches. I still smile every time I see our caramel poached pear crisp get plated and served. I like to grill fresh oysters, with garlic butter, then adding that to BBQ Baby Back Ribs. The Challenge is fun, keeps me thinking. I like to see what everyone else does too. One of the most popular was an appetizer dish – Pan Seared Sea Scallops with a Saffron-Lemon Risotto and Asparagus Tips. One of my favorite dishes to cook is – Rack of Lamb Encrusted with Garlic and Dijon with a Veal Demi-glace with Chanterelle Mushrooms. I would have to say my favorite meal on my day off is braised pork shoulder with a apple brandy demiglaze, roasted fennel mashed potatoes and sauteed green beans! Yummy!!!!! At least in the cold months. I am competing in the culinary completion to have fun, to improvise, and to create delicious food! My favorite meal to create at the Ashland Creek Inn is a brie and rosemary ham wrapped herb crepe with poached eggs and a creamy truffle hollandaise. As well as a citrus beet and blue cheese salad with candied pecans and balsamic reduction. How’s that for making you hungry? I know I am after reading all of these answers! This sounds like such an amazing time. I love seeing what chefs’ favorite meals to eat and cook are. Me too, I loved hearing what they love to cook and eat! What a fun post! I love that one chef likes to make bread at home on a day off. Sounds perfect to me! I know right, totally agree. I loved their answers. Thank you! I am definitely hungry! A burger with jam and goat cheese frosting sounds very interesting. I wish I could try that! I’m not much of a competitor so I really, really admire chefs who can compete and focus. I am writing another interview post and am so hungry again lol! Thank you. What a delicious assignment! Hope you’ll share who won and all the details of your favorite dishes! I agree! I will be sharing a photo collage follow up and a written one too! I will remember to share my favorite dish :).